Your future telephone may never should be charged. 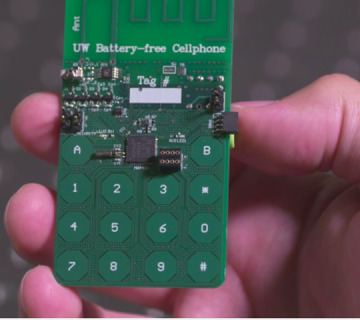 That is the energizing ramifications of new research out of the College of Washington, where scientists have made a cell phone model that doesn't require a battery to work. The incredibly proficient model requires only 3.5 microwatts of juice, and it utilizes a creative way to deal with dodge the requirement for a battery cell. Rather, it utilizes surrounding power from radio flags and light — its installed sunlight based cell is "generally the span of a grain of rice" — to transmit a flag back to a base station 50 feet away. The model itself is made of straightforward materials: capacitive touch catches, a circuit board, and other "off the rack" parts. More noteworthy is that the group of researchers could make a custom base station to transmit the flag with such a little measure of energy. Utilizing this setup, the scientists could effectively make and get calls (by means of Skype) and place guests on hold. In any case, the researchers say they need to enhance the model by including an e-ink show with video-gushing abilities and encryption to make the calls more secure. Vamsi Tall, who coauthored the paper, says the base station innovation they created — while it's as yet an early model — could make it workable for without battery cell phones to wind up noticeably pervasive. "You could envision later on that all cell towers or Wi-Fi switches could accompany our base station innovation installed in it," Tall said. "Furthermore, if each house has a Wi-Fi switch in it, you could get sans battery cellphone scope all over the place."